This anime will be available in theaters on June 10, 2005. The above info came from atomofish, and was edited by yours truly (contact me). The image came from Nausicaa.net. 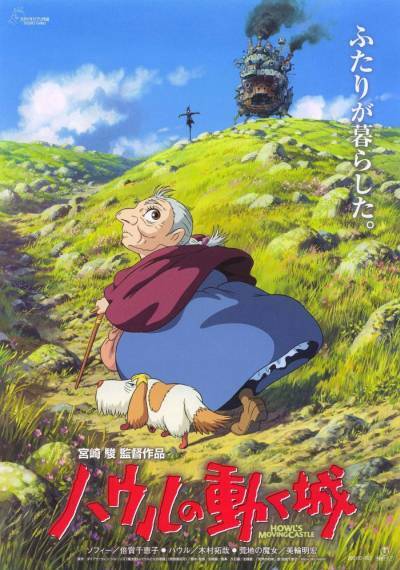 Howl's Moving Castle tells the story of Sophie, a young girl who lives in an era where Wizards and Witches co-exist and are fighting in the middle of a destructive war. Her life is changed one night when she is turned into an old woman by the Witch of the Waste. She meets the mysterious and legendary wizard named Howl, who travels around in a giant crawling castle with his assistant Markl, a living scarecrow named Turnip Head and the fire demon Calcifer. She joins Howl in his journeys and attempts to find the way to undo the curse that was placed on her. The book and the movie differ in that there is no war going on at all in the book. This was most likely added to the anime to make it more exciting. In the book, Howl just happens to be a powerful wizard trying to get rid of the curse upon him and Calcifer that the Witch of the Waste made. Sophie, an normal teenage girl working in a hat shop, finds her life thrown into a turmoil when she is literally swept off her feet by a handsome yet mysterious wizard named Howl. She is subsequently turned into a 90 year old woman by the vain and conniving Wicked Witch of the Waste. Embarking on an awesome odyssey to lift the curse, Sophie finds refuge in Howl's moving castle where she meets a hot-headed fire demon named Calcifer, Markl, Howl's Apprentice. Sophie's love and support comes to have a huge impact on Howl, who flies in the face of orders from the palace to become a pawn of war and instead risks his life to help bring peace to the kingdom. The above description came from Abby StronhArm, and was edited by yours truly (contact me).